President and Mrs. Obama paint MLK quotes on library walls. I saw these reports on the evening news and I thought it was wonderful that President Barack Obama and his family did their annual MLK day of service in a school library. This is a great example of the importance of libraries! The President's team thought a library was worthy of his time and good enough for a background for a major media appearance. Please share this post and use this opportunity to publicize the importance of school libraries. If school libraries are important enough for the First Family to work on, aren't they important enough to fund and staff ? For those who aren't familiar with it, here's an explanation of the Martin Luther King, Jr. Day of Service. Here are links to various news stories about the service work that was done today at the Browne Education Center in Washington, D.C. 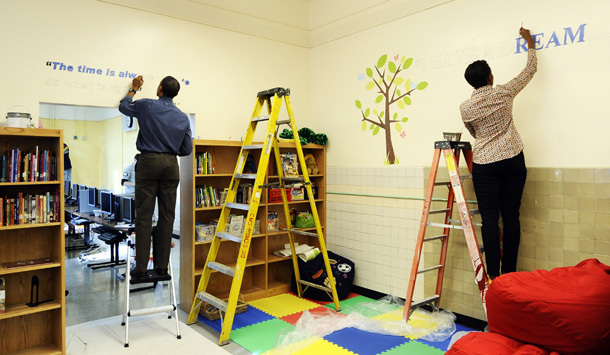 The Obamas and other helped build bookshelves and paint walls. Obama Volunteers on MLK Day, Addresses Controversy Over Memorial Inscription. Fox News. Obamas mark MLK's birthday by volunteering. CBS News. Obamas Observe Martin Luther King Day With Volunteer Service. Huffington Post.